The Pueblo Bonito Pacifica in Cabo San Lucas is a luxury, holistic retreat and spa. If you're seeking wellness and relaxation this resort is for you. It's the only one of it's kind in Cabo San Lucas Mexico. 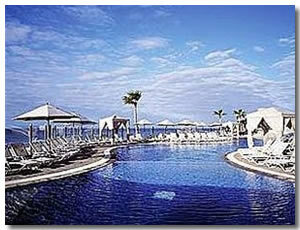 It's location is right next to the The Pueblo Bonito Sunset Beach on the Pacific ocean side of the Baja Peninsula. The main part of this resort is the Armonia Spa. It has a state-of-the-art exercise studio, jacuzzi, steam ,sauna and more. It also has the extra relaxation of it being an adult only retreat. Your room will be in a one of the six-story buildings they have at the Pueblo Bonito Pacifica. You will either have a balcony with a Pacific Ocean view or a ground floor room with a patio. You get a comfortable feather bed as you do with all the Pueblo Bonito resorts. Even the toiletries are Zen inspired for your relaxing stay which include robe and slippers. The restaurants at the Pueblo Bonito Pacifica in Cabo San Lucas are not as extensive as the other Pueblo resorts. The good thing about this is you can use any of the restaurants at the Pueblo Bonito Sunset Beach and the Pueblo Bonito Rose during your stay. Siempre - A restaurant that's surrounded by water and serves traditional and spa meals. Aire - This is a circular swim up bar that is located in the main pool. Jugos - This is the place for you if you like your fruit juice. Get refreshing juice drinks at this juice bar. If you're looking for a reason to go out of the resort then going to the Pueblo Bonito Sunset Beach and the Pueblo Bonito Rose for a meal or two is a good one. You have two heated pools to relax yourself by. You won't have as much trouble getting a lounger as you do at other hotels. The pools also have some underwater music as well just to add to the well being experience. The Armonia Spa is a complete detoxifying experience. Being situated on a seclude part of Cabo San Lucas a car rental is a good idea if you plan on going out of the resort a lot. If it's just the odd trip to downtown cabo then you might prefer cab rides. Going out further and doing some site seeing will require a car rental as your cab fares soon add up. For a truly relaxing vacation the Pueblo Bonito Pacifica in Cabo San Lucas is a good choice. With a Spa, and ambient music playing it feels like paradise.